Indulge in the splendor of reflective metallics and vibrant colors, even over the darkest colored stocks. This specialty technique produces your artwork in your choice of foil color stamped onto the card for stunning results. Premium foil colors including Metallic Black, Red, Gold and Silver, as well as Matte White are popular choices. We have a wide range of other beautiful foil colors available - let us know the color you're looking for and an Estimator will help you find the perfect match. Foiling can be added to a wide range of cardstocks to create different results. White foil can produce a gorgeous contrast on colored stock like Brown Kraft, while Metallic Gold foil looks stunning on any simple white uncoated paper. You can even combine foiling with Spot UV on Smooth Matte Laminate stock for a truly impressive business card. Looking for foiling on specialty stock like Wood or Cotton? Want to add the glamour of foil to other products like letterheads, presentation folders or invitations? Request a Print Quote to add foiling to any of your custom projects. Order your custom foil stamped printed projects today. Order a Specialty Sample Pack to receive samples of embossing and other exciting specialty products! 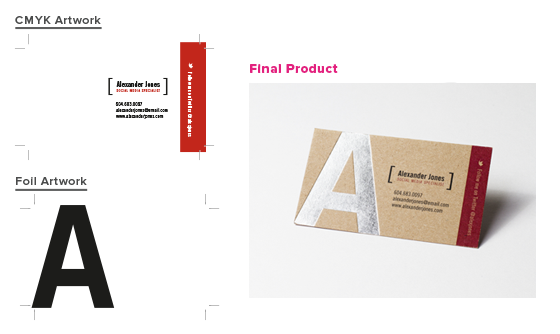 For ultimate elegance, use foil to upgrade your Cotton business cards. The light hues of Bright White, Off-White and Cream Cotton look impeccable with a touch of foil, especially with metallic or holographic foil. This combination will sure brighten up your business cards! Class and finesse make up this understated Premium Black Business Card. By simply using two foil colors, gold for the text and black for the patterned background, any effortless design (like this one) can undoubtedly make the best business cards. See: What Foil Colors are available? Foiling or foil stamping is a premium printing method that involves the creation of a custom metal die of your artwork. The die is used to stamp the foil material onto the surface of your product. We offer many different colors and finishes of foil; ranging from Matte White, to metallic colors like Gold or Silver. The cost of foil is calculated based on each color used on each side of your design. request including details of your custom needs. We also have foil samples available to view at our offices or through a Specialty Sample Pack. How can I see all the colors of foil that you offer? Many of our specialty additions are not kept in stock until needed for an order. Please place a Print Quote request with the color(s) you are interested in for foiling, and we will do our best to fulfill your request. Some products are only available with foil, like our Premium Black business cards. Other stocks allow for ink printing as well as foil stamping. When combining the two processes, you will need to submit a separate file for the artwork to be produced in foil and the artwork that is to be printed. It’s also important to note that printed artwork can only be registered to foil artwork with offset printing. If you are trying to align foil with other printed artwork, please keep in mind that shifting up to 1/16" will be expected. You will need to create a black and white file of your foil artwork, where the black areas indicate where you want the foil placed and the white areas will show where you do not want foil. This can be done in many ways in your design program by setting up new layers, defining a new artboard (new page) or creating a separate file. The areas for treatment (foil) will need to be defined in black ink, and the black color used must be CMYK Black only, with no grey colors or other inks. The design must be created in vector format (such as in Illustrator or InDesign). Export each separation as a press-ready PDF file. If you have multiple colors of foil in your order, you will need to create the artwork for each color as a separate file. Name your files according to the TYPE, COLOUR, SET and SIDE. For example, One set of cards with gold foil on the front and silver foil on the back would be as follows: "Foil_Gold_Set1_Front" and "Foil_Silver_Set1_Back".